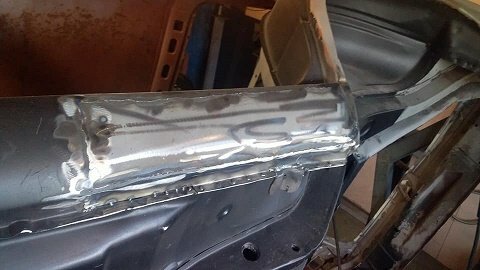 got a few diff things done. 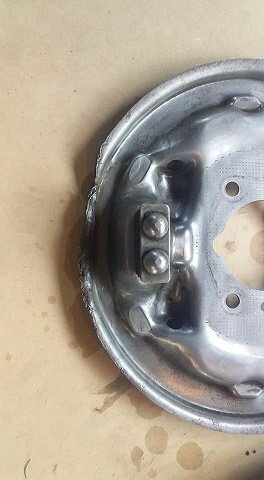 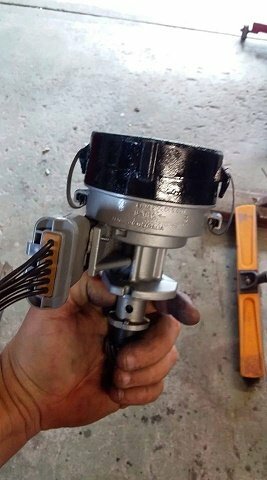 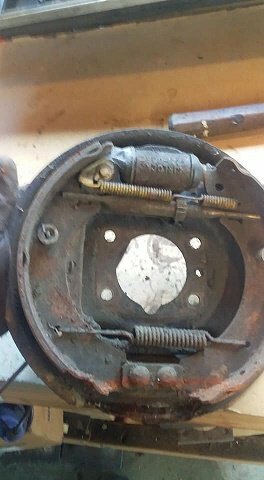 i was thinking about rear brakes and doing a disc conversion as i didnt have any rear brakes for it. 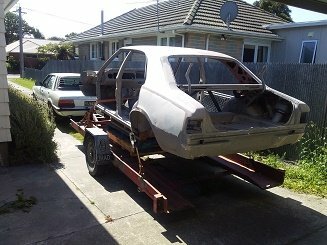 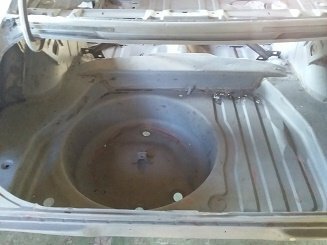 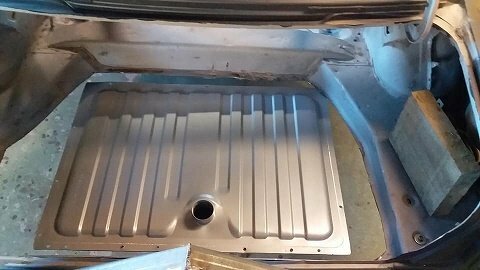 but i then thought the easiest way would be to use factory aussie drums...they came on a 6 cylinder cortina soooooooooo must work well on a cortina with a 6 in it. 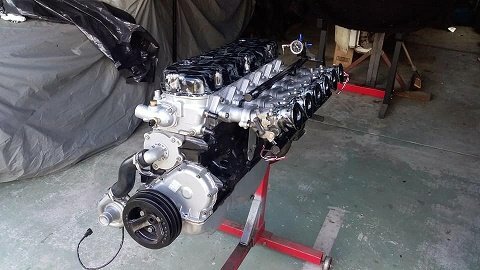 (keep cert man happy aswell) and its not going to have a million hp. 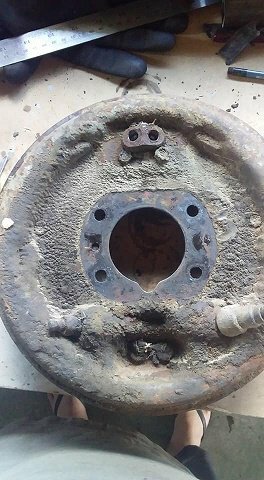 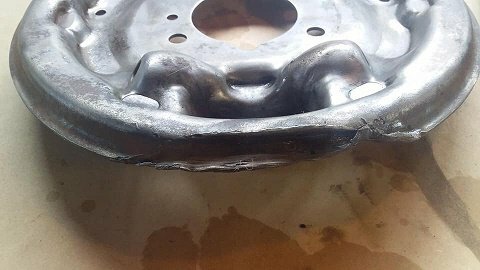 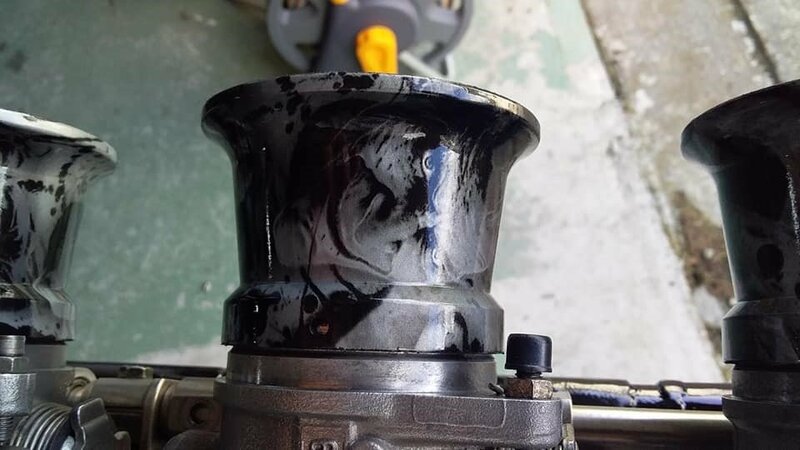 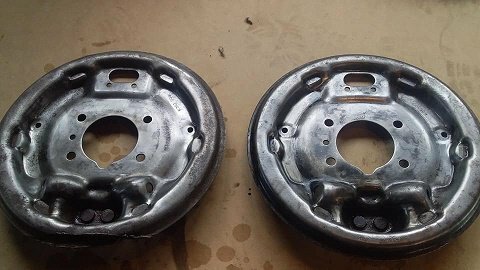 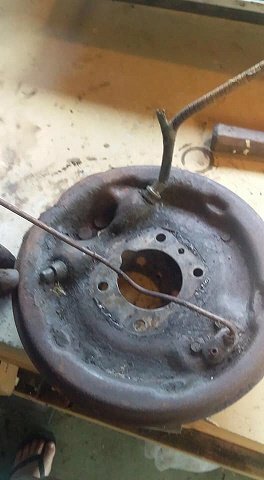 so thanks to @J-W-G igot my hands on a set of factory aussie assembled rear drums..seen better days but nothing a rebuild wont fix.......and the best price. 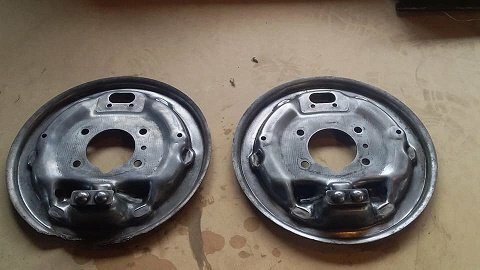 and after a few hours i got the backing plates all cleaned up ready to have the backs painted in POR15. 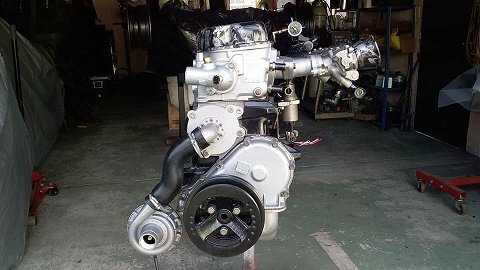 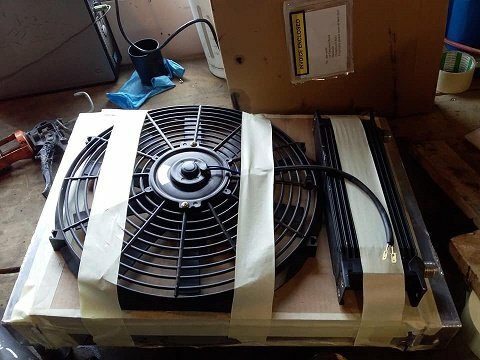 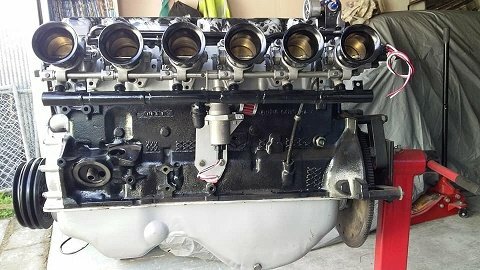 just a quick update motor is almost done ..just need to sort the throttle linkage (pretty much sussed) injectors (might get the factory ones cleaned or go later model) spark (going coil on plug from a later model) and last but not least headers ........going to make from scratch . 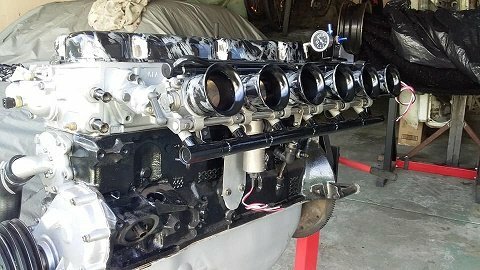 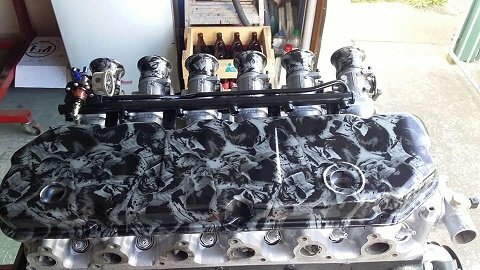 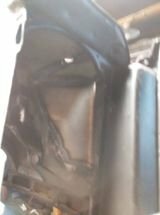 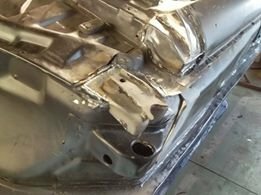 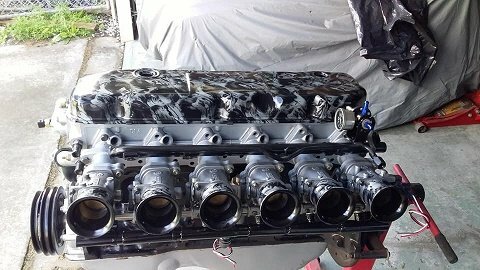 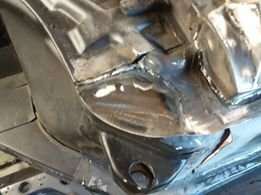 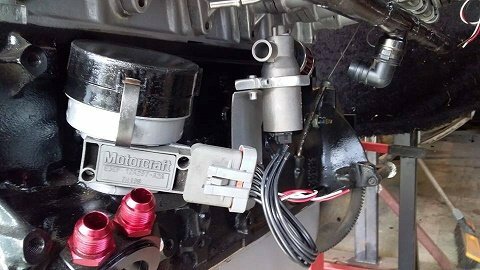 apart from that Hydroprint Hq here in nz did the rocker cover and trumpets for me and i love it. 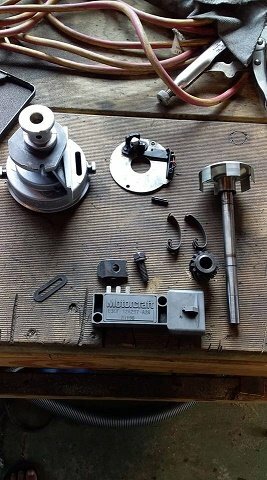 thought i would have a play with falcon TFI dizzy i had that came with all the injection bits i bought. 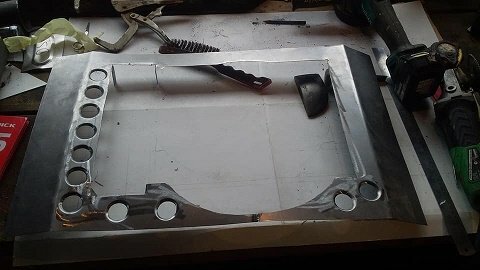 only wanted was the hall effect as a trigger for the ecu and also for the oil pump. 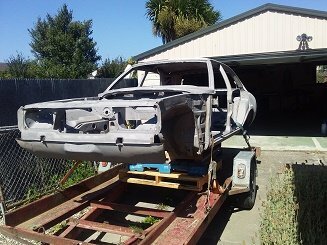 well now it's a new year and the girls have gone back to school .........it's time. 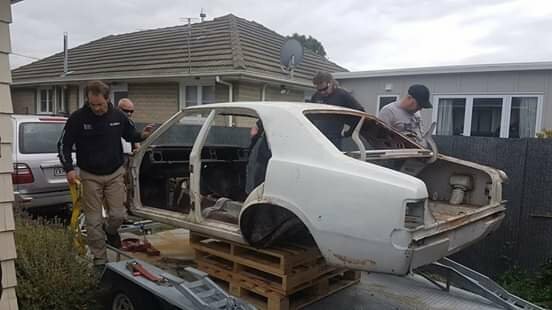 so the old girl is off to blasting... hopefully we can lift it off the trailer once it's done and not sweet it off. 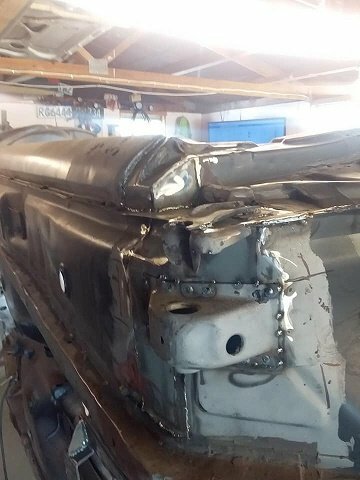 so the plan is to metal prep and POR15 all the good bits till im left with just the repair ares. 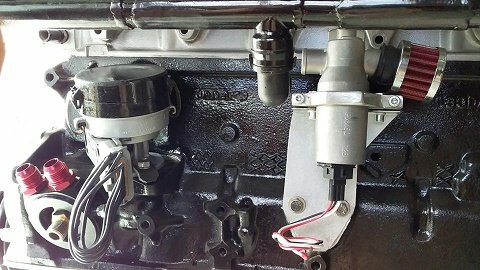 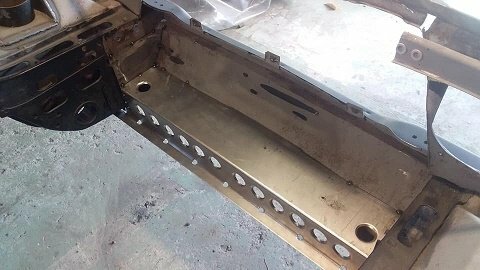 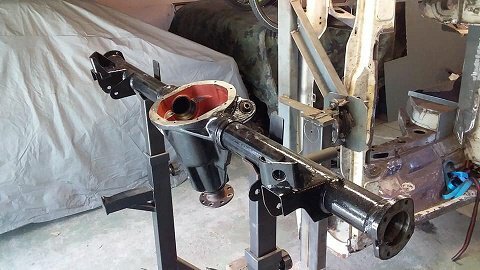 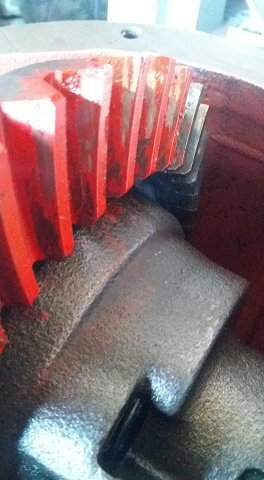 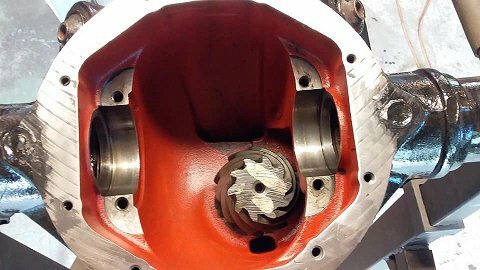 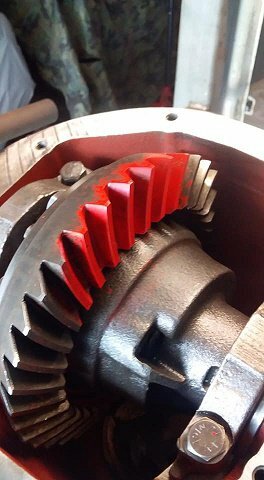 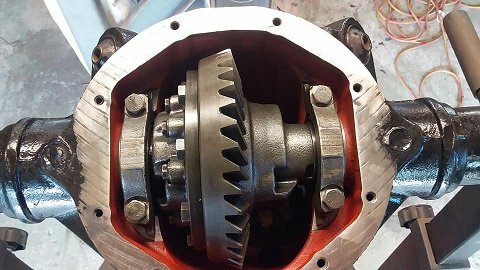 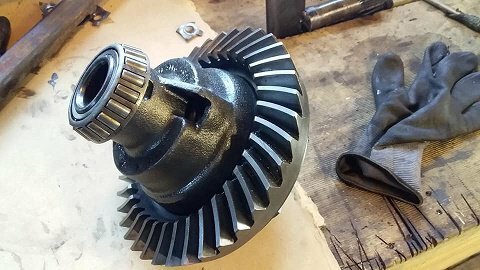 all so took the time to fit the stuffed gearbox mount threads. 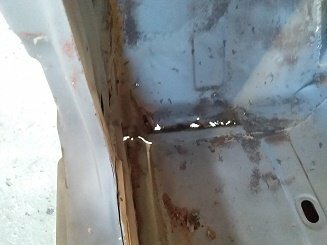 started doing what i believe to be the worst/most difficult rust are ...2 hours so far and about half way done. 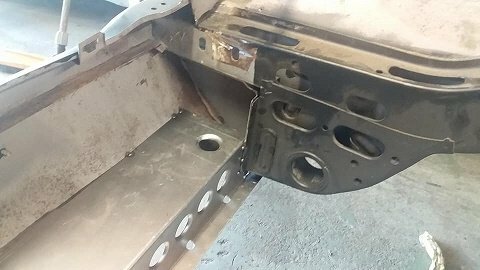 straitened the jack mount and put back on. 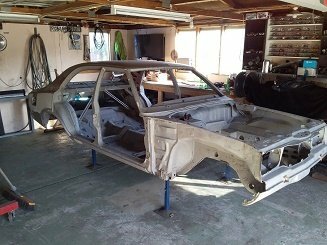 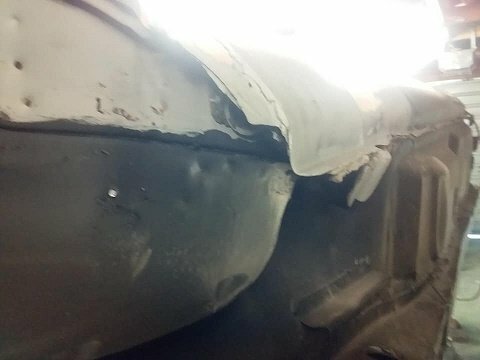 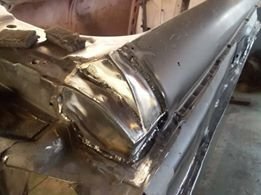 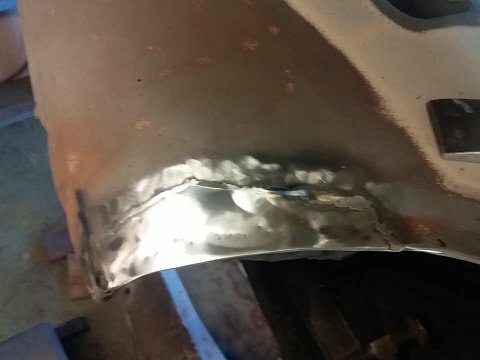 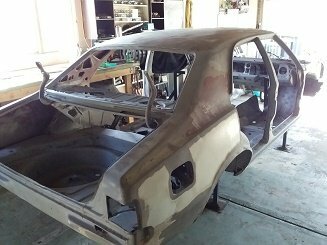 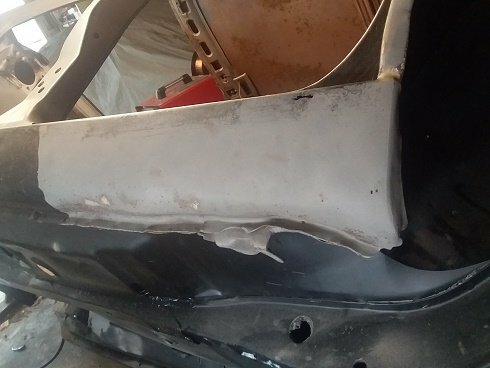 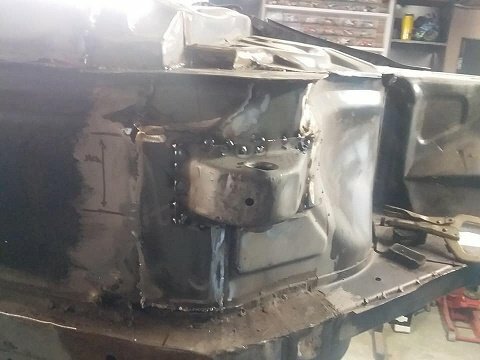 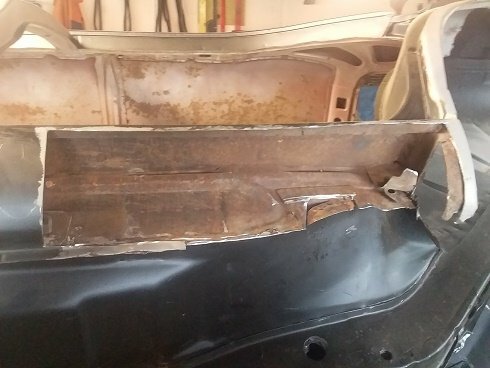 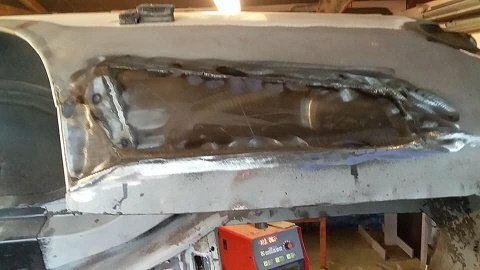 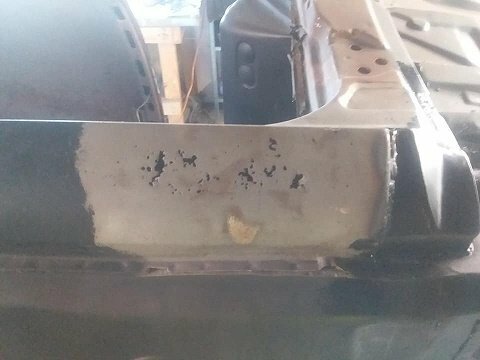 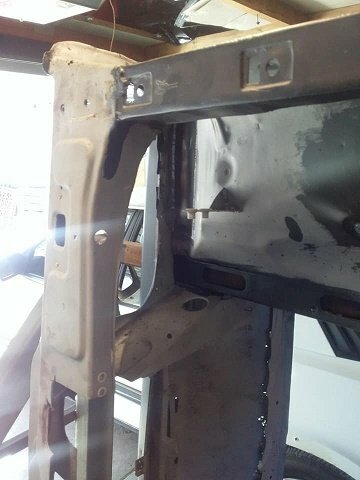 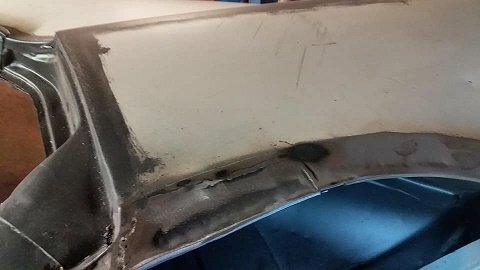 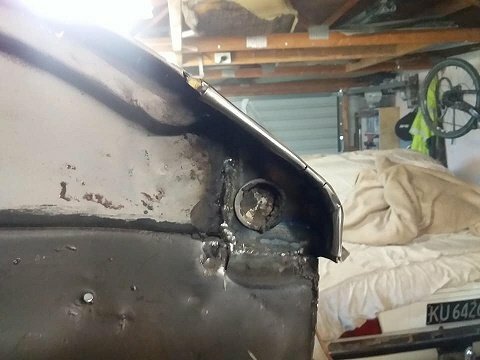 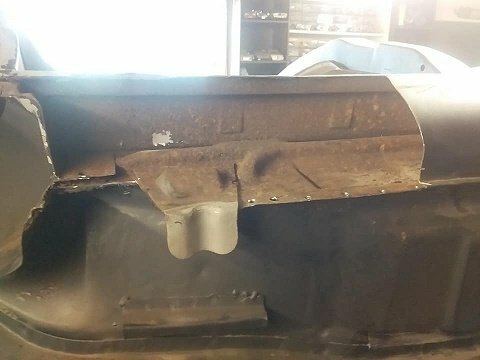 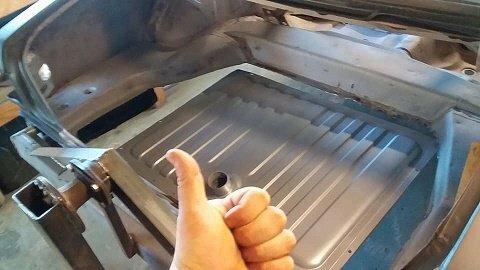 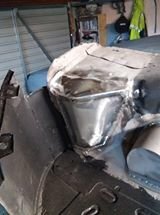 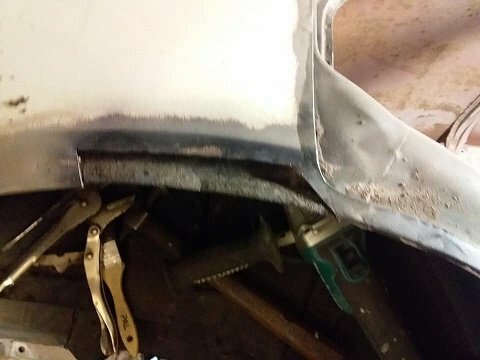 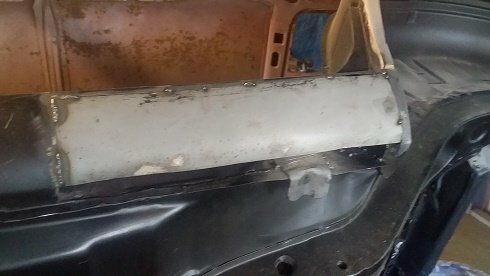 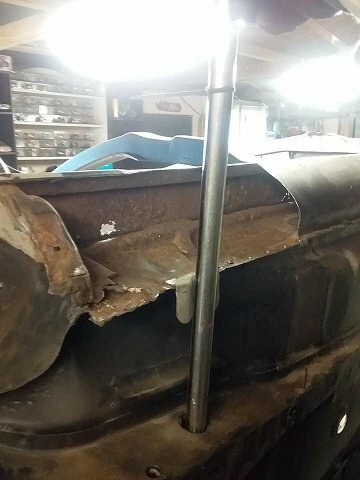 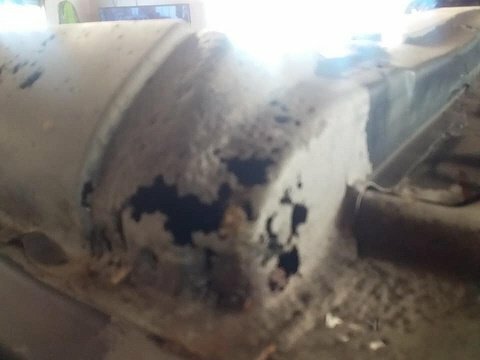 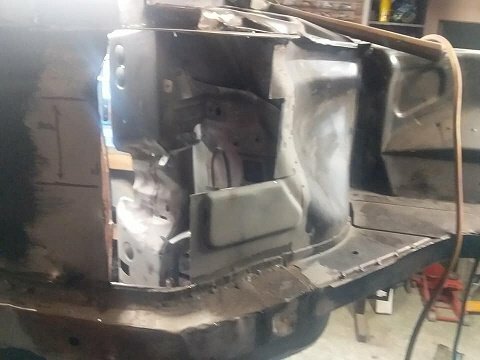 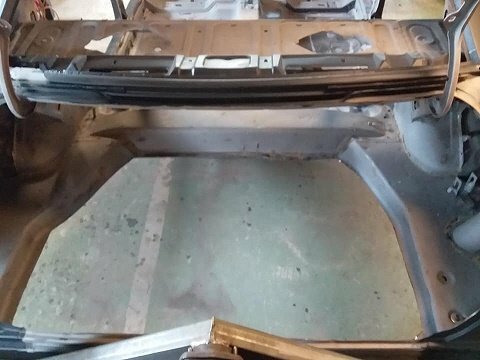 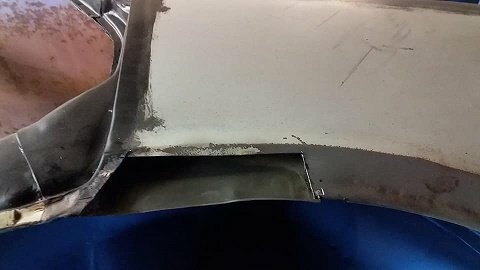 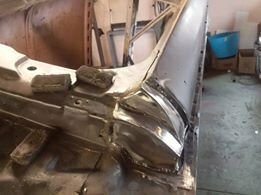 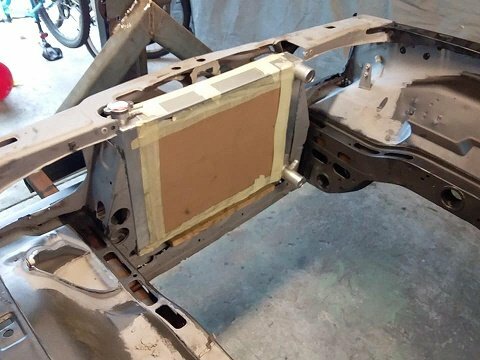 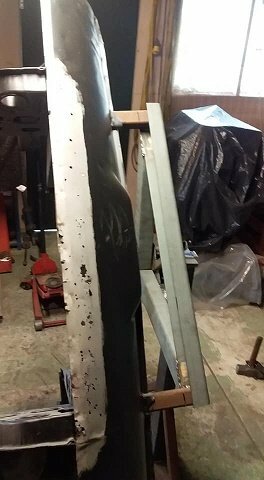 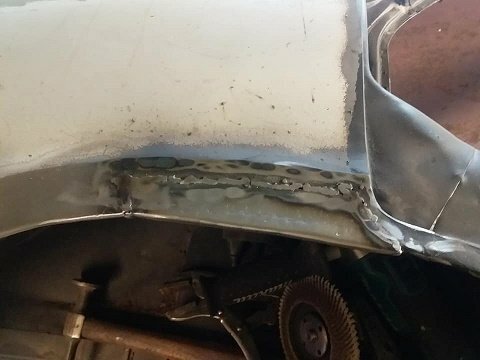 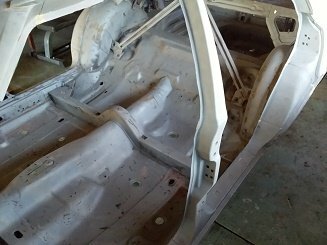 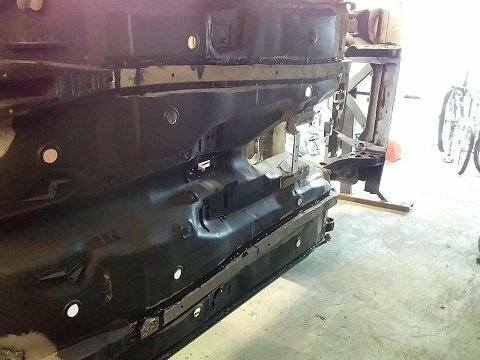 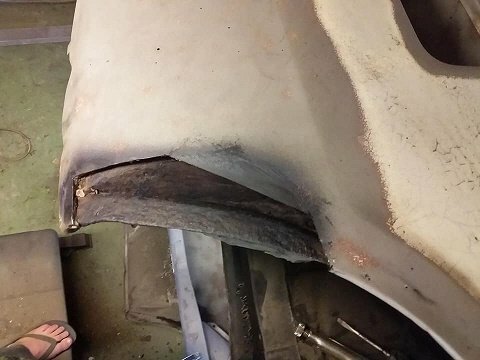 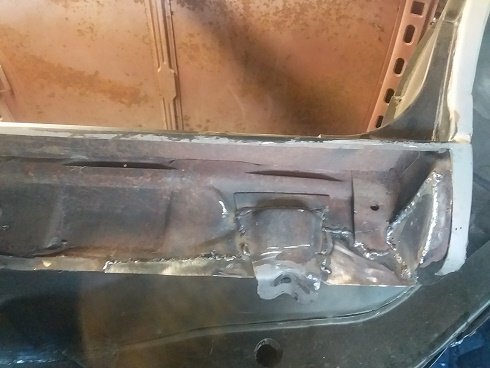 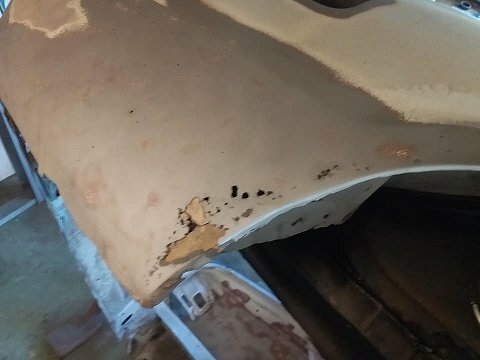 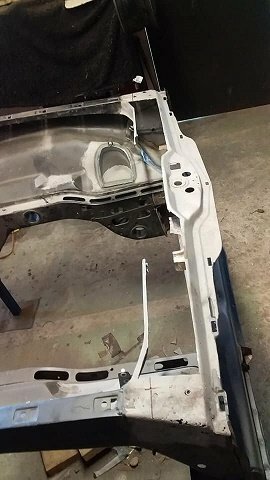 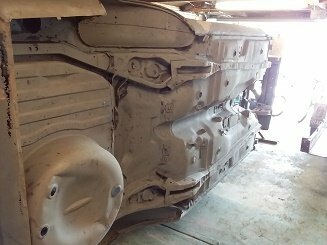 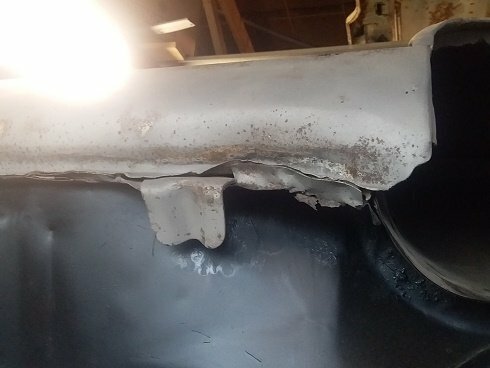 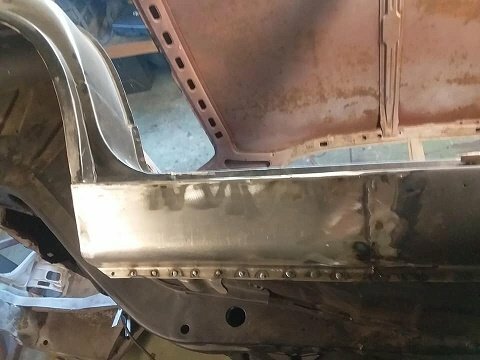 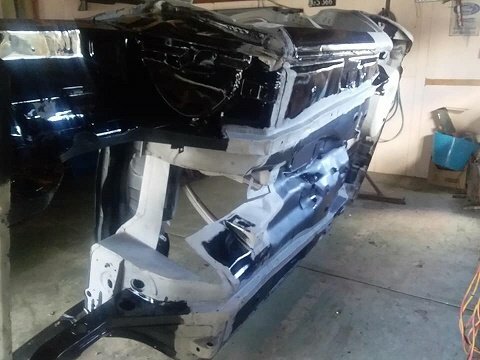 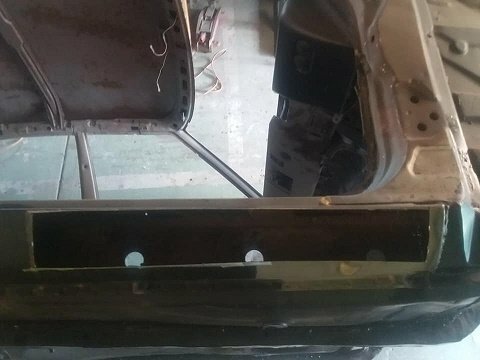 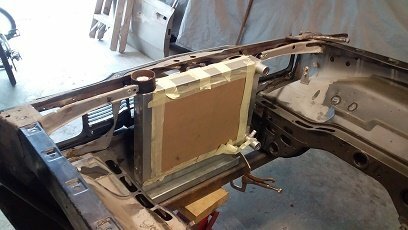 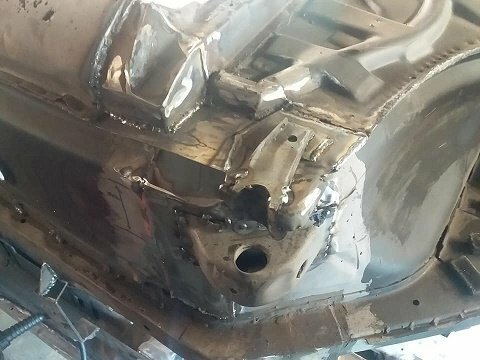 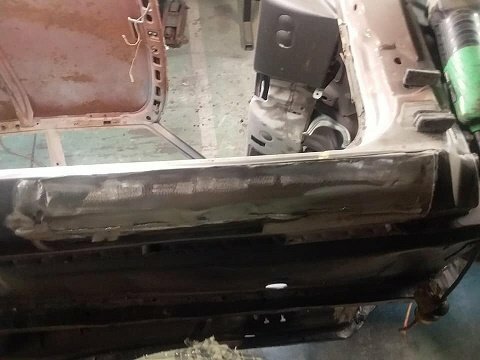 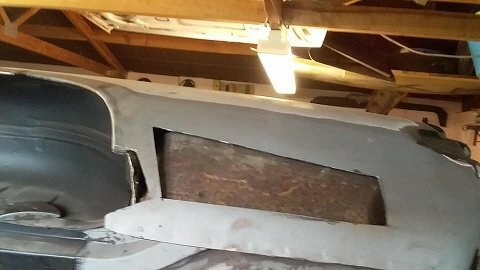 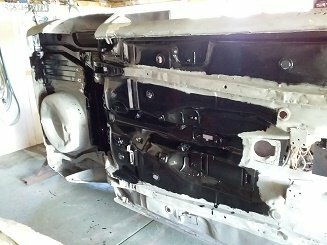 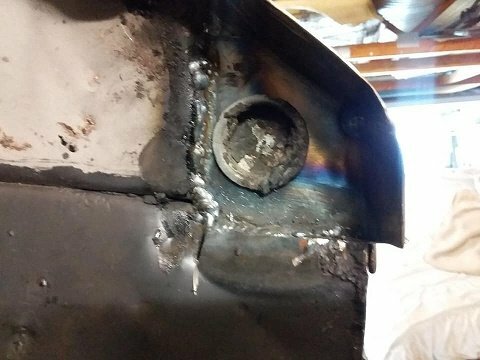 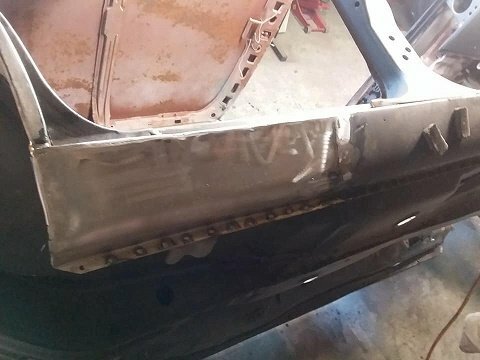 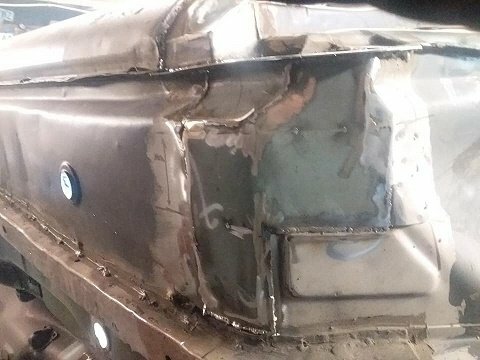 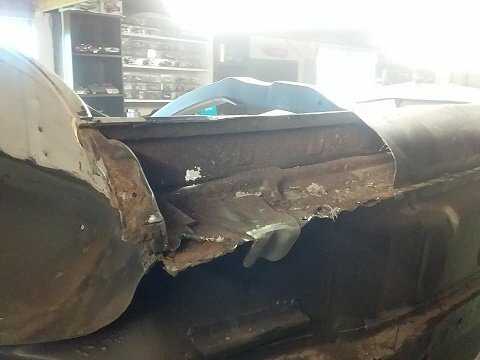 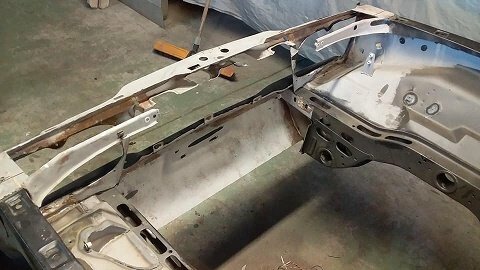 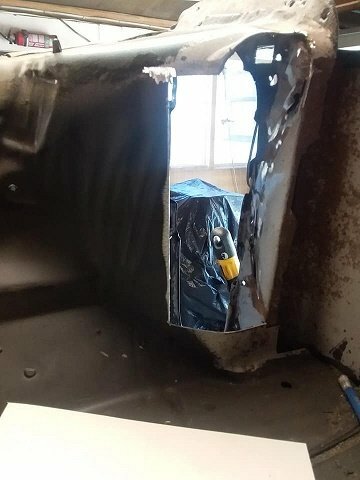 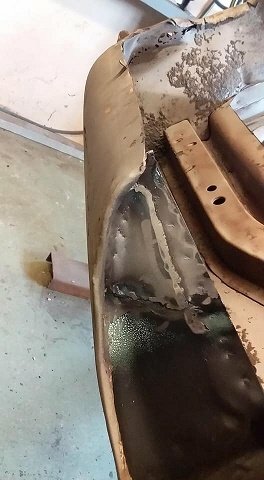 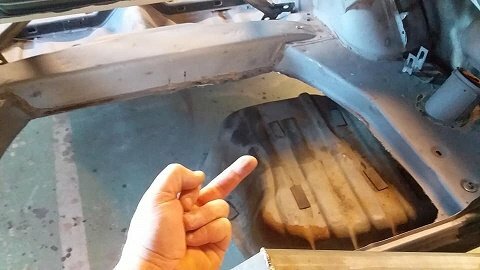 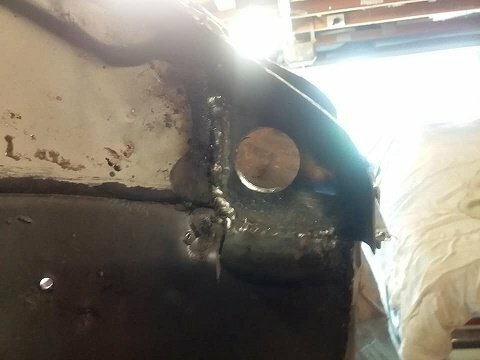 time for the driver side sill....starting with the front end... thought it would have been a small patch but by the time i found clean metal it got bigger. 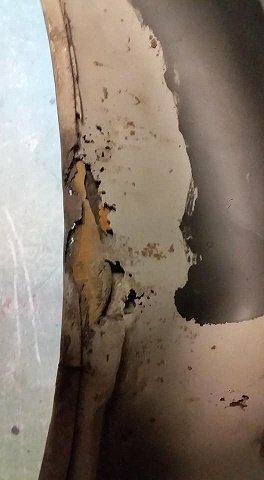 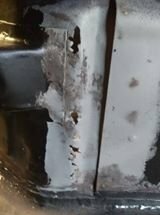 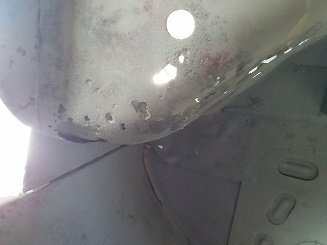 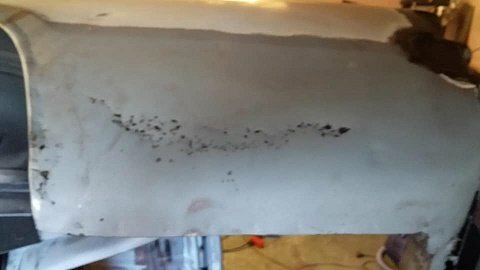 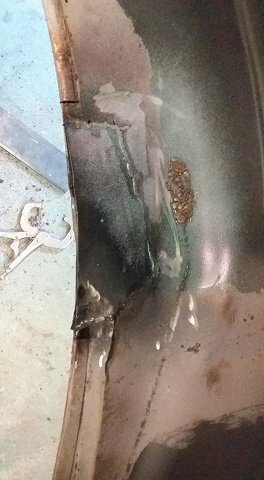 so i think i might have all the rust on the drivers underside done. 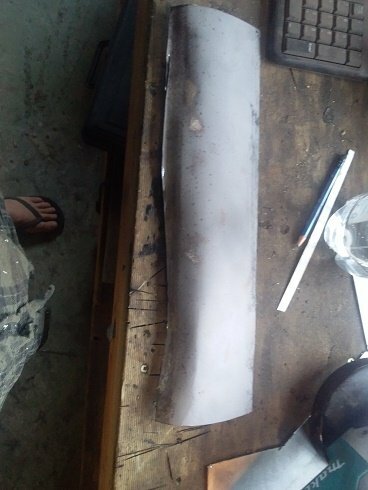 got the cap at the end of the sill done. 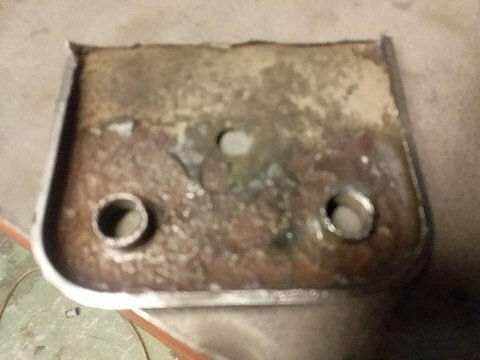 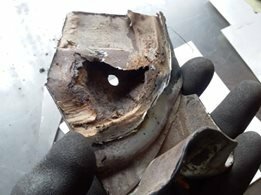 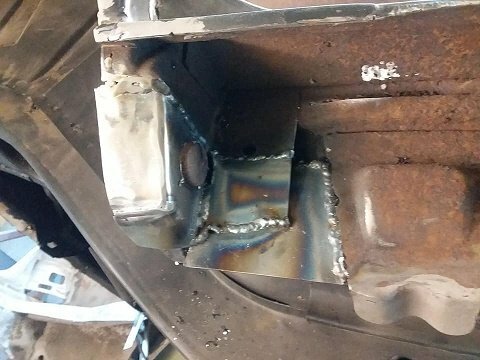 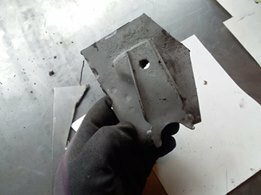 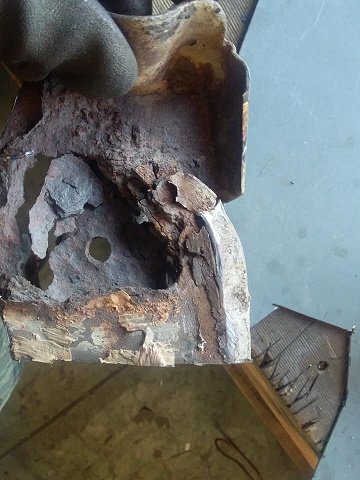 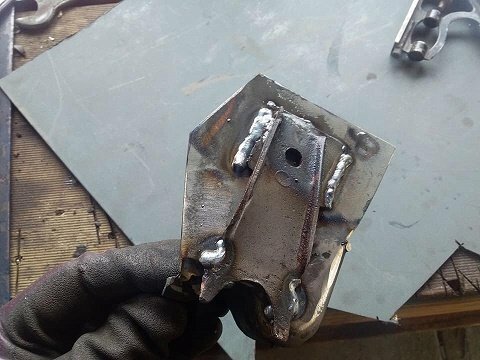 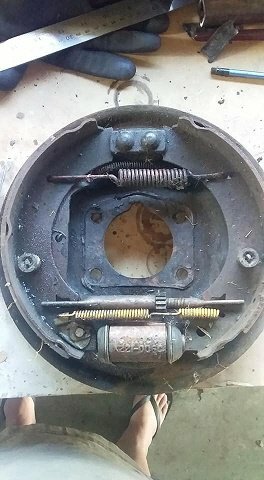 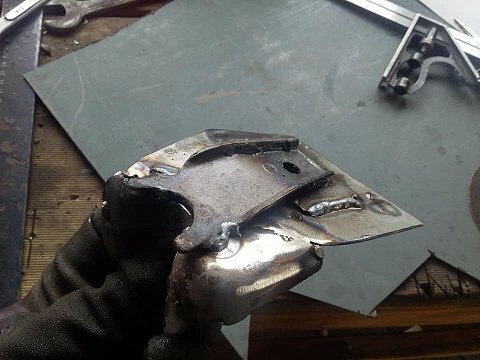 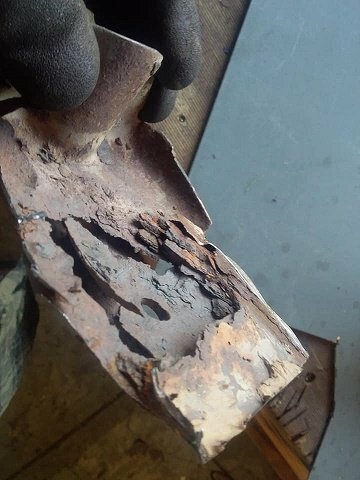 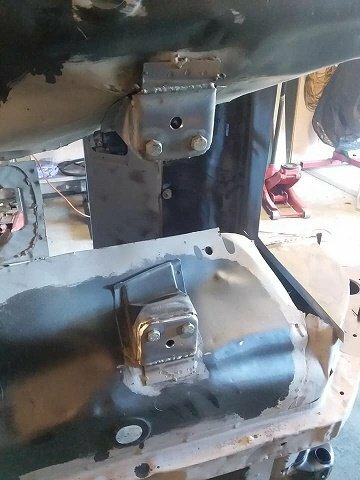 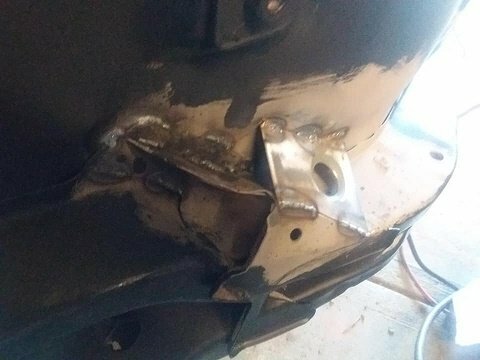 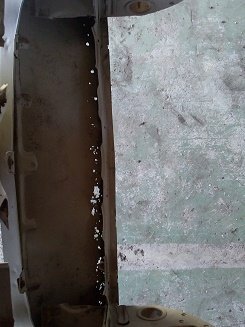 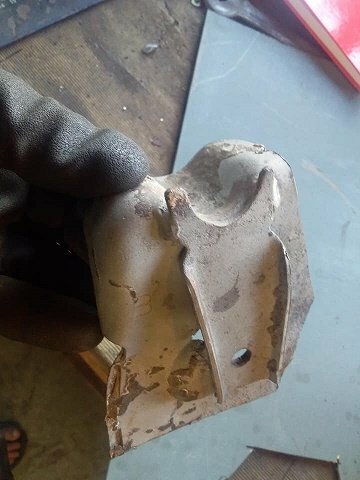 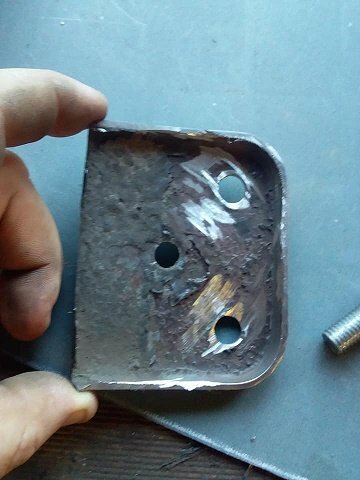 the jack brace looked but looking from the inside it was rusted so i cut it out cleaned it up welded in a new brace and welded back on. 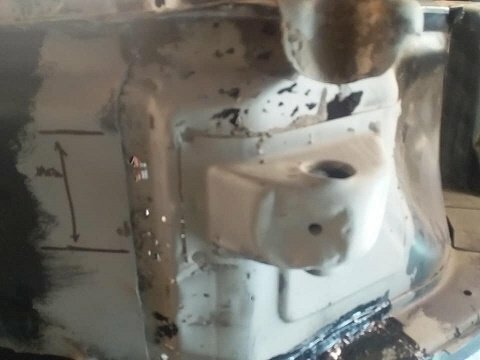 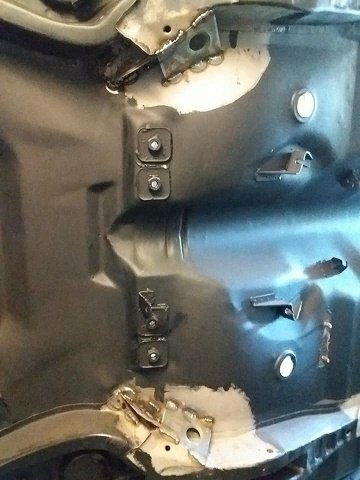 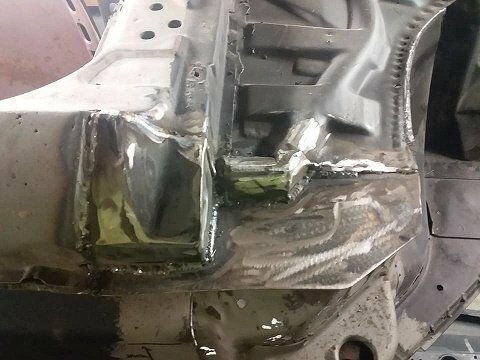 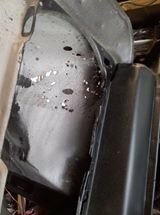 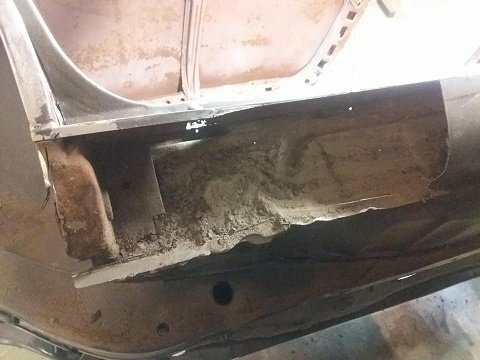 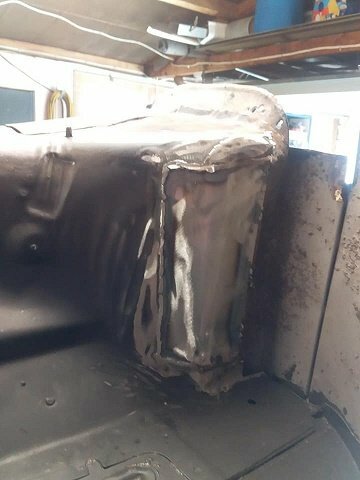 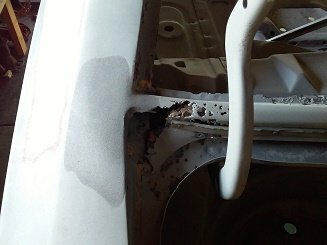 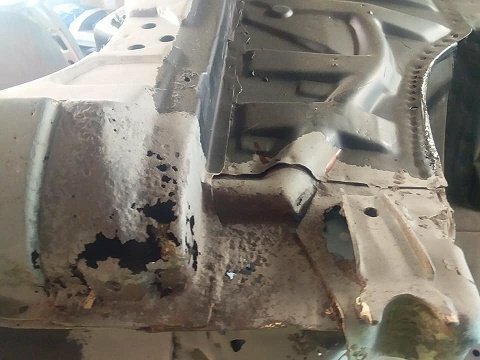 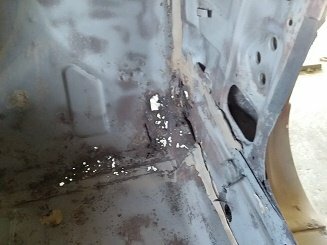 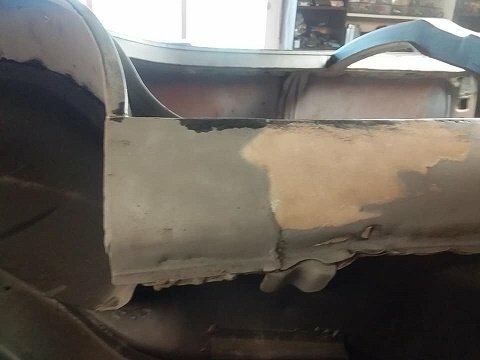 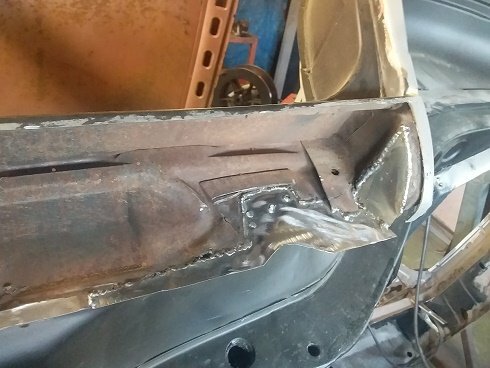 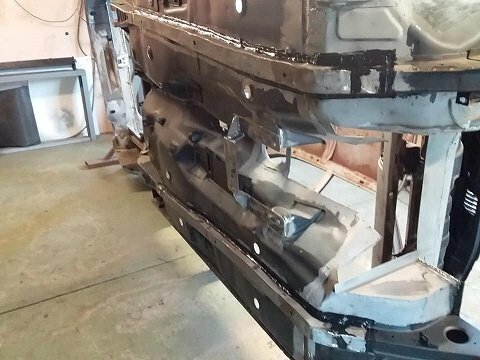 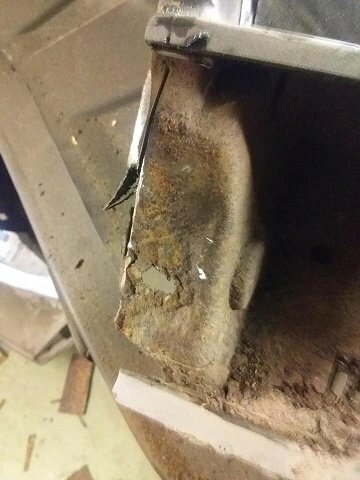 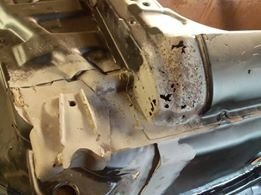 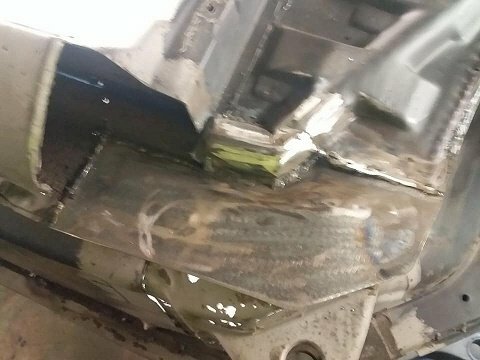 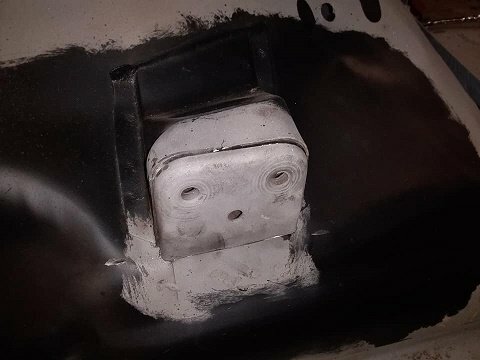 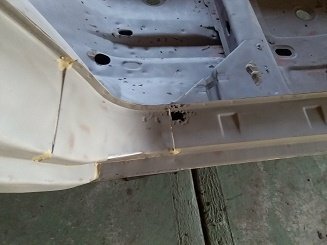 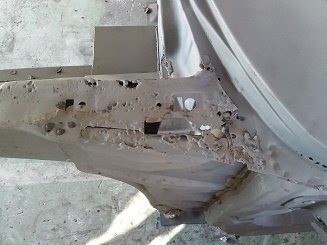 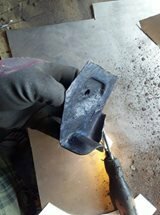 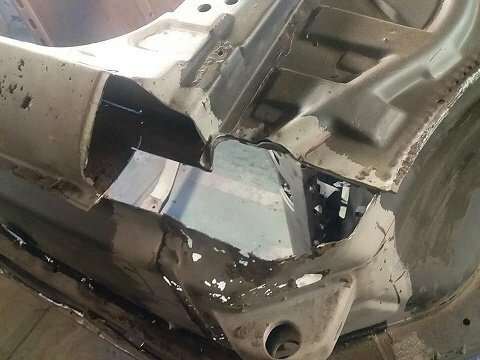 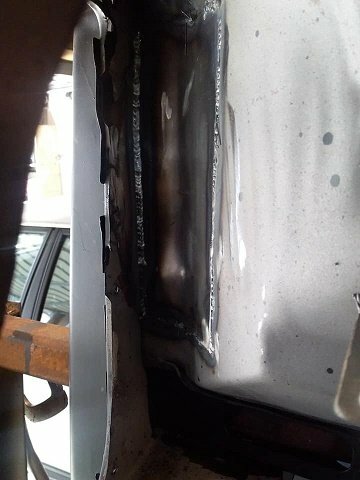 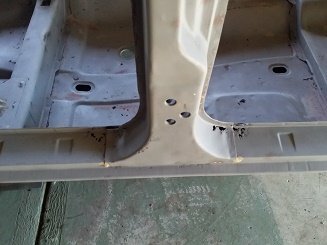 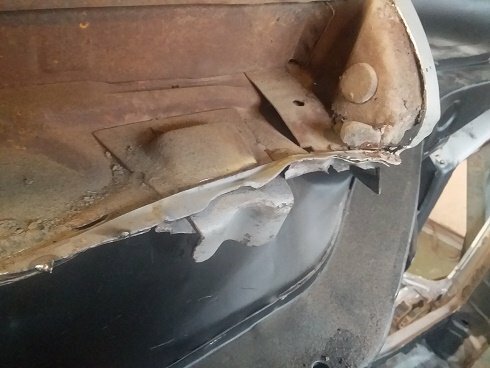 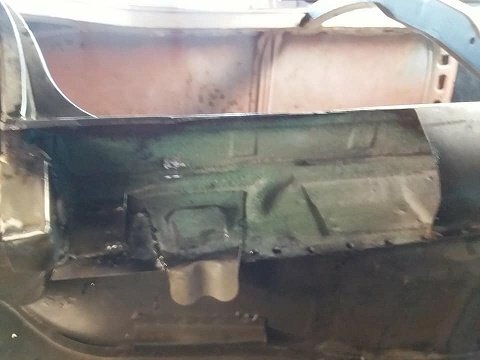 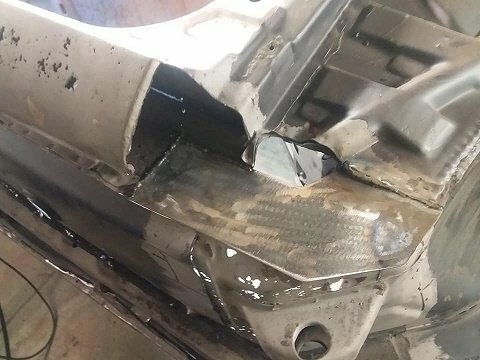 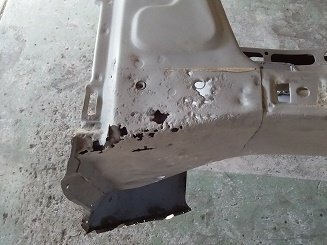 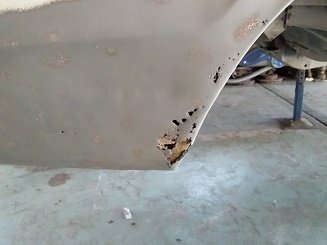 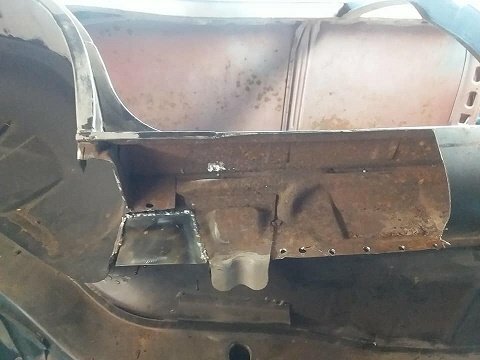 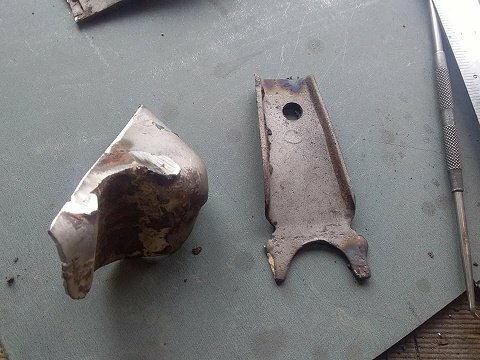 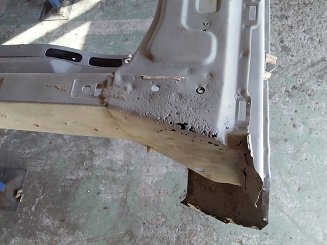 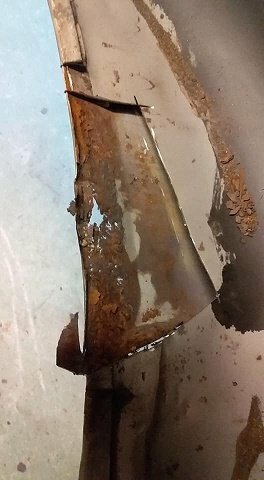 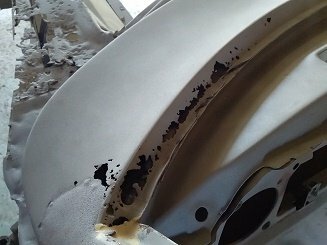 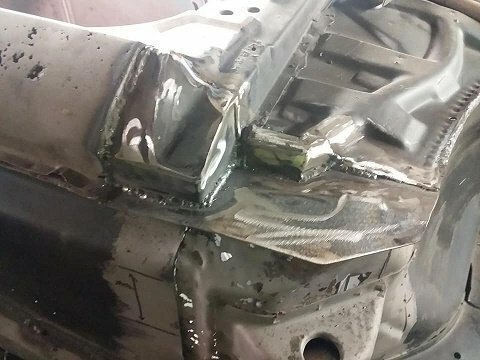 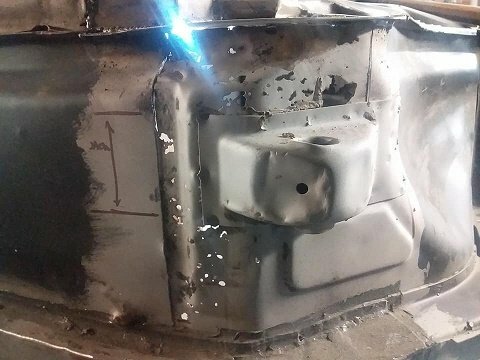 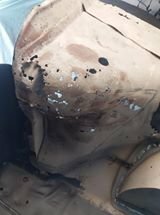 the passenger side sill....it was smashed in ...i tried with my huge dent puller but decided to cut into it........till the gas run out. 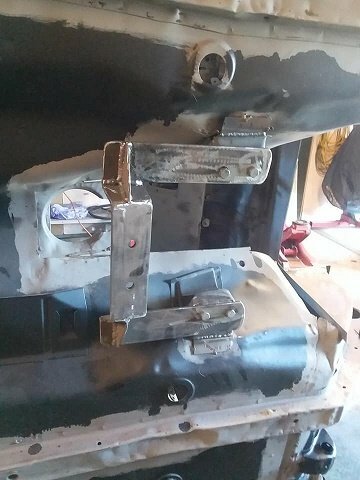 the there is the front....i wanted to do the front lower panel rust..but i realized i needed to make the radiator support parts first and to do that i needed to cut everything thing out i didn't want. 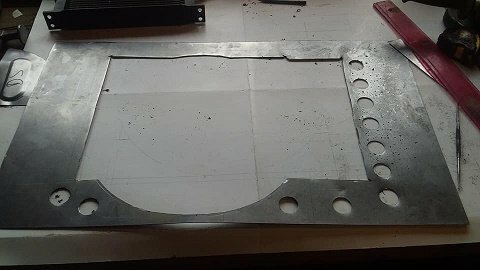 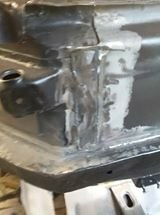 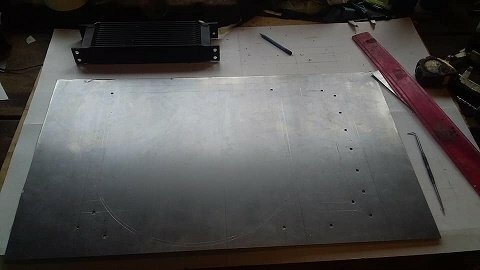 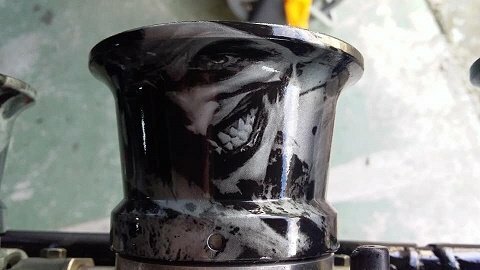 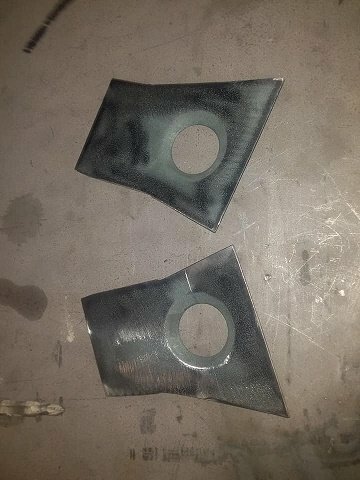 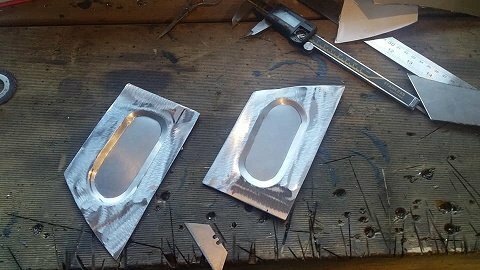 some more trimming and i think i have the base plate done. 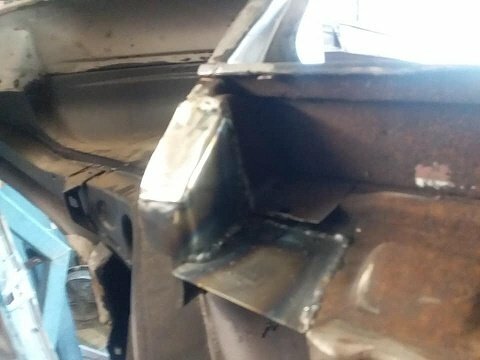 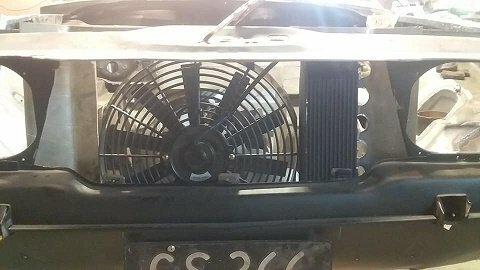 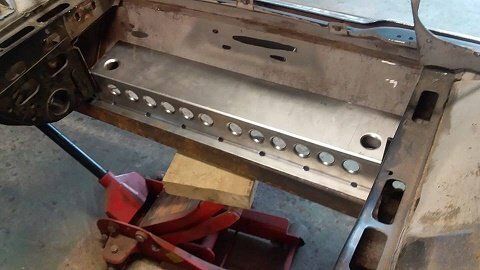 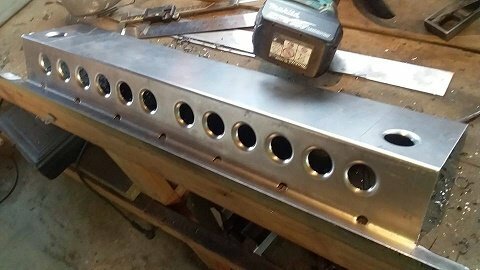 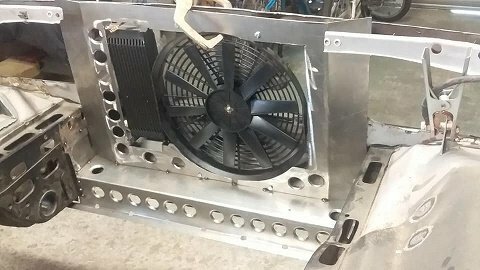 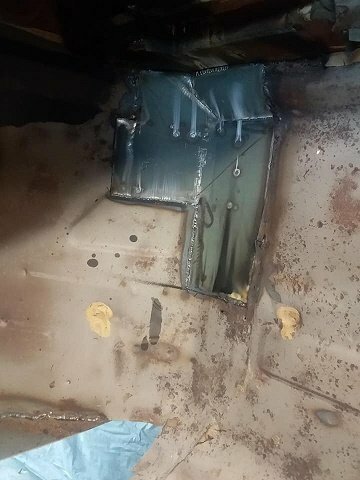 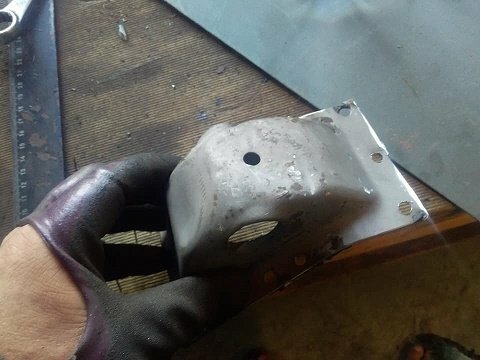 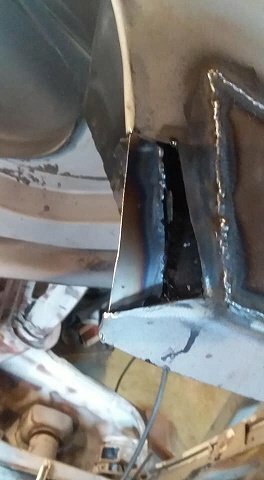 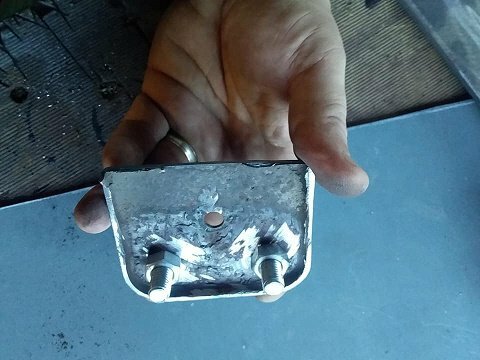 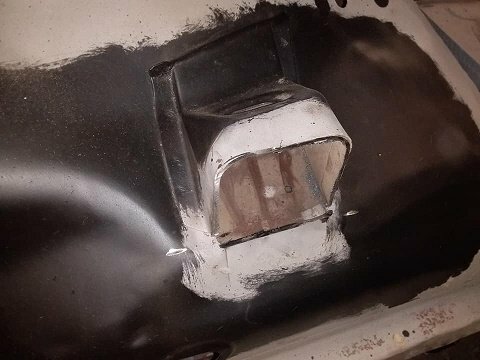 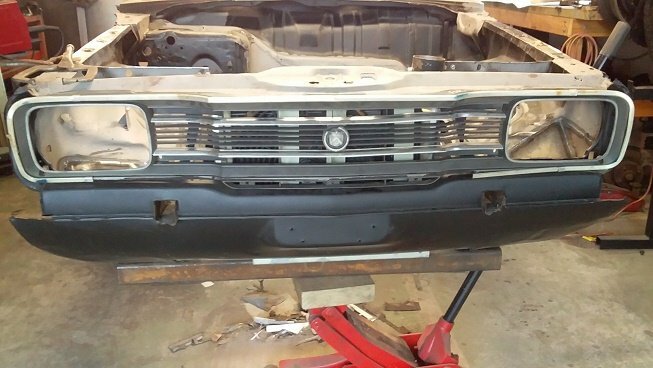 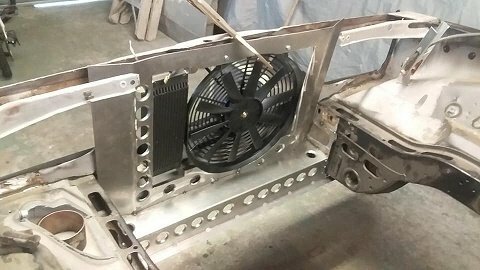 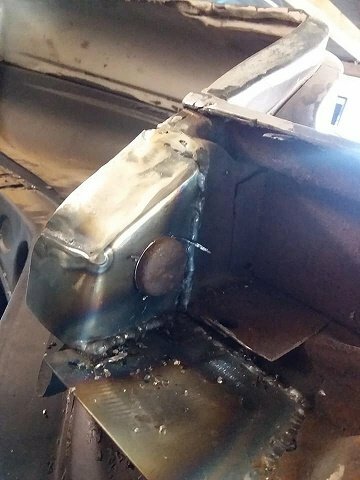 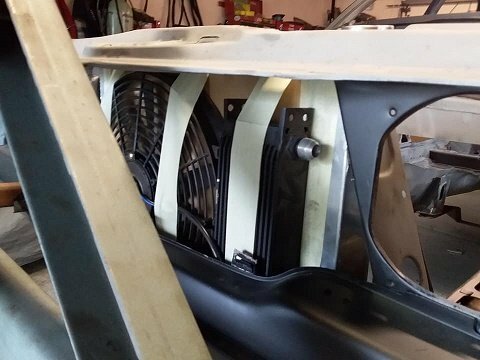 made some ends to cap off the bottom plate....just all tacked in for now..
the i had a look at the fan and oilcooler support panel...just had to make sure i could get the grill on...and be able to remove and replace fan and oil cooler if needed....before i weld the panel fully in..